Coastal systems are increasingly stressed by inputs of nutrients from land, groundwater, the atmosphere, and ocean. Symptoms of nutrification include hypoxic (dead) zones and blooms of phytoplankton, macroalgae, and harmful algae. We expect that these stresses will be exacerbated as climate change results in increased temperatures, storminess, and sea level rise. My research asks, what can we do about nutrient enrichment; what do we expect in the future? We study the sources and fates of nutrients, primarily nitrogen and carbon, in riverine and estuarine systems, marshes, and in shallow coastal embayments. The fates of nutrients are influenced by microbial community composition, chemical, biological and physical regulators including the chemical composition of the nutrients, light quality and quantity, temperature, sediment type, dissolved oxygen, sediment resuspension, water column stratification, and water residence time. We use a wide variety of state of the art sensors and stable isotope techniques in the field and laboratory. Examples of projects that we are involved with include a Defense Coastal Estuarine Research program (DCERP) funded by the Department of Defense along with colleagues at the University of North Carolina, University of Connecticut and the NOAA Beaufort lab to develop carbon budgets for the New River estuary in North Carolina and for the adjacent marsh systems. Development of a carbon budget is a highly interdisciplinary exercise. We work closely with estuarine, marsh and microbial ecologists, geologists, and modelers. We have also just completed several studies demonstrating the effects of oysters and clams on sediment and water quality. Although oysters under some environmental conditions play an important role in removing particulates and nitrogen and thereby improving water quality, the same may not be true of clams. Environmental context is all important in determining their impact on ecosystem health. NSF-LTER: Long-Term Ecological Research on Disturbance, Succession, and Ecosystem State Change at the Virginia Coast Reserve. Murphy, A.E., I.C. Anderson, M. W. Luckenbach. 2015. Enhanced nutrient regeneration at commercial hard clam (Mercenaria mercenaria) beds and the role of macroalgae. Marine Ecology Progress Series 530: 135-151. Hardison, AK, Canuel, EA, Anderson, IC, Tobias, CR, Veuger, B and Waters, MN. (2013). Microphytobenthos and benthic macroalgae determine sediment organic matter composition in shallow photic sediments. Biogeosciences. 10:5571-5588. Lake, SJ, Brush, MJ, Anderson, IC and Kator, HI. (2013). Internal versus external drivers of periodic hypoxia in a coastal plain tributary. Mar Ecol Prog Ser. 492:21-39..
Giordano, JP, Brush, MJ, Anderson, IC (2012). Ecosystem metabolism in shallow coastal lagoons: Patterns and partitioning of planktonic, benthic, and integrated community rates. Mar Ecol Prog Ser. 458:21-38. Hardison, AK, Anderson, IC, Canuel, EA, Tobias, CR, and Veuger, B. (2011). Carbon and nitrogen dynamics in shallow photic systems: Interactions between macroalgae, microalgae, and bacteria. Limnol. Oceanogr. 56(4):1489-1503. Giordano, JP, Brush, MJ, Anderson, IC (2011). Quantifying annual nitrogen loads to Virginia's coastal lagoons: sources and water quality response. Est. Coasts, 34:297-309. Hardison, A, Tobias, C, Stanhope, J., Canuel, E., Anderson, I. (2011). An experimental apparatus for laboratory and field-based perfusion of sediment porewater with dissolved tracers. Est. Coasts, 34:243-255. Hardison, AK, Canuel, EA, Anderson, IC, Veuger, B (2010). Fate of macroalgae in benthic systems: carbon and nitrogen cycling within the microbial community. Mar. Ecol. Prog. Ser. 414:41-55. Anderson, IC, Stanhope, JW, Hardison, AK, and McGlathery, KJ (2010). Sources and fates of nitrogen in Virginia coastal bays. In: Kennish, M. and Paerl, H. (Eds). Coastal Lagoons: Critical Habitats of Environmental Change. CRC Press, Boca Raton FL, pp 43 - 72. Christian, RR, Voss, CM, Bondavalli, C, Viaroli, P, Naldi, M, Tyler, AC, Anderson, IC, McGlathery, KJ, Ulanowicz, RE, and Camacho-Ibar, V. (2010) Ecosystem health indexed through networks of nitrogen cycling. In: Kennish, M. and Paerl, H (Eds). Coastal Lagoons: Critical Habitats of Environmental Change. CRC Press, Boca Raton FL, pp 73 - 90. Li, Y., M.J. Brush, H.V. Wang, I.C. Anderson, and G.M. Sisson. 2008. Effects of benthic microalgae on eutrophication processes - a laboratory experiment and the model simulation. Pp. 590-606 in: M.L. Spaulding (ed. ), Estuarine and coastal modeling: proceedings of the tenth international conference, November 5–7, 2007, Newport, RI. American Society of Civil Engineers, Reston, VA.
Aranibar, J. N., Anderson, I. C., Epstein, H. E., Feral, C. J. W., Swap, R. J. Ramontso, J., and Macko, S. A. (2008) Nitrogen isotope composition of soils, C3 and C4 plants along land use gradients in southern Africa. J. Arid Environ. 72:326-337. Joye, S. B. and I. Anderson, 2008. Nitrogen cycling in Estuarine and Nearshore Sediments. In: Capone, D., Bronk, D., Carpenter, E. and Mulholland, M. (Eds), Nitrogen in the Marine Environment, Springer Verlag, Chapter 19, pp 868-915. McGlathery, K. J., Sundback, K, Anderson, I. C. (2007) Eutrophication in shallow coastal bays and lagoons: the role of plants in the coastal filter. Mar. Ecol Prog. Ser. 348: 1 – 18. Neubauer, S. C., Anderson, I. C., and Neikirk, B. B. 2005. Nitrogen cycling and ecosystem exchanges in a Virginia tidal freshwater marsh. Estuaries. 28:909-922. McGlathery, K., Sundbäck, K., Anderson, I. C. (2004) The importance of primary producers for the benthic nitrogen and phosphorus cycling. In The influence of Primary Producers on Estuarine Nutrient Cycling edited by Nielsen, S.L., G. T. Banta & M. F. Pedersen, Kluwer Academic Publishers. pp. 232-263. Anderson, I. C., McGlathery, K. J., and Tyler, A. C. 2003. Microbial mediation of ‘reactive nitrogen’ transformations in a temperate lagoon. Marine Ecology Progress Series. 246: 73-84. Neubauer, S. C. and Anderson, I. C. 2003. Transport of dissolved inorganic carbon from a tidal freshwater marsh to the York River estuary. Limnology and Oceanography. 48(1): 299-307. Aranibar, J. A., Anderson, I. C., Ringrose, S., and Macko, S. A.2003. The importance of cyanobacterial crusts as a source of nitrogen to Southern Aftrican arid ecosystems – indicated by acetylene reduction and stable isotopes. J. Arid Environments. 54:345-358. Aranibar, J.N., I.C. Anderson, A.L.F. Potgieter, S.A.Macko, H.H. Shugart and R. Sowry (2003). Nutrient cycling response to fire frequency in the Kruger National Park (South Africa) indicated by stable isotopes. Isotopes in Environmental Health Studies. 39:141-158. Tyler, A. C., K. J. McGlathery, and I. C. Anderson. 2003. Benthic algae control sediment-water column fluxes of organic and inorganic nitrogen compounds in a temperate lagoon. Limnology and Oceanography, 48:2125-2137. Kopacek, J., Stuchlik, E., Vesely, J., Schaumburg, J., Anderson, I, Fott, J., Hejzlar, J., and Vrba, J. 2002. Hysteresis in reversal of Central European mountain lakes from atmospheric acidification. Water, Air, and Soil Pollution: 2(2):91-114. Tobias, C.R., Macko, S.A., Anderson, I.C., Canuel, E.A., and Harvey, J.W. 2001. Tracking the fate of a high concentration groundwater nitrate plume through a fringing marsh: A combined groundwater tracer and in situ isotope enrichment study. Limnology and Oceanography. 46(8): 1977-1989. Miller, W. D., Neubauer, S. C., and Anderson, I. C. 2001. Effects of sea level induced disturbances on high salt marsh metabolism. Estuaries. 24(3): 357-367. Tobias, C. R., Harvey, J. W., and Anderson, I.C. 2001. Quantifying groundwater discharge through fringing wetlands to estuaries: Seasonal variability, methods comparison, and implications for wetland-estuary exchange. Limnol. Oceanogr. 46(3) 604-615. Tobias, C. R., Anderson, I. C., Canuel E. A., and Macko, S. A. 2001. Nitrogen cycling through a fringing marsh - aquifer ecotone. Marine Ecology Progress Series. 210: 25-39. Tyler, A. C., McGlathery, K. J., and Anderson, I. C. 2001. Macroalgal mediation of dissolved organic nitrogen fluxes in a temperate coastal lagoon. Est. Coastal Shelf Sci. 53:155-168. McGlathery, K. J., Anderson, I. C., and Tyler, A. C. 2001. Magnitude and variability of benthic and pelagic metabolism in a temperate coastal lagoon. Marine Ecology Progress Series. 216:1-15. Anderson, I. C., Tobias, C. R., Macko, S. A., and Poth, M. A. 2000. Sources and sinks of nitrogen in acidified glacial lakes of the Bohemian Forest, Czech Republic. Silva Gabreta. 4: 135-146. Neubauer, S. C., Miller, W. D., and Anderson, I. C. 2000. Carbon cycling in a tidal freshwater marsh ecosystem: a gas flux study. Marine Ecology Progress Series. 199: 13-30. Korontzi, S. K., Macko, S. A., Anderson, I. C. and Poth, M. A. 2000. Carbon and nitrogen biogeochemical processes in a disturbed southern Californian forest ecosystem. Global Biogeochemical Cycles. 14: 177-188. Sin, Y., Wetzel, R. L., Anderson, I. C. 2000. Seasonal variations of size fractionated phytoplankton along the salinity gradient in the York River Estuary, Virginia. Journal of Plankton Research. 22: 1945-1960. Sin, Y., Wetzel, R. L., Anderson, I. C. 1999. Spatial and temporal characteristics of phytoplankton and nutrients in the York River estuary: Analysis of long term data. Estuaries. 22:260-275. Bytnerowicz, A. Godzik, S., Poth, M., Anderson, I, Szdzuj, J, Tobias, C., Macko, S., Kubiesa, P.,Staszewski, T., and Fenn, M. 1999. Chemical composition of air, soil, and vegetation in forests of the Silesian Beskid mountains, Poland. Water, Air, and Soil Pollution. 116: 141-150. Anderson, I. C. and Poth, M. A. 1998. ­Controls on fluxes of trace gases from Brazilian Cerrado soils. Journal of Environmental Quality, 27: 1117-1124. Anderson, I. C., Tobias, C. R., Neikirk, B. B., and Wetzel, R. L. (1997). Development of a process-based mass balance model for a Virginia Spartina alterniflora salt marsh: implications for net DIN flux. Mar. Ecol. Prog. Ser. 159, 13-27. Poth, M. A., Anderson, I. C., Miranda, H. S., Miranda, A. C., and Riggan, P. J. (1995). The magnitude and persistence of soil CH4, N2O, NO, and CO2 fluxes from burned tropical savanna in Brazil. Global Biogeochemical Cycles. 9(4): 503-513. Anderson, I. C., Poth, M. A., Homstead, J., and Burdige, D. J. 1993. A Comparison of NO and N2O Production by the autotrophic nitrifier Nitrosomonas europaea and the heterotrophic nitrifier Alcaligenes faecalis . Appl. Environ. Microbiol. 59: 3525-3533. Anderson, I. C. and M. A. Poth. 1989. Semi-annual losses of nitrogen as NO and N2O from unburned and burned chaparral. Global Biogeochem. Cycles. 3: 121 - 135. Anderson, I. C., J. S. Levine, M. A. Poth, and P. J. Riggan. 1988. Enhanced emissions of biogenic nitric oxide and nitrous oxide from semi-arid soils following surface biomass burning. J. Geophys. Res. 93: 3893 - 3898. Anderson, I. C. and J. S. Levine. 1987. Simultaneous field measurements of biogenic emissions of nitric oxide and nitrous oxide. J. Geophys. Res. 92: 965 - 976. Anderson, I. C. and J. S. Levine. 1986. Relative rates of nitric oxide and nitrous oxide production by nitrifiers, denitrifiers, and nitrate respirers. Appl. Environ. Microbiol. 51: 938-944. Levine, J. S., T. R. Augustsson, I. C. Anderson, and J. M. Hoell, Jr. 1984. Tropospheric sources of NO: lightning and biology. Atmospher. Environ. 18: 1797 - 1804. Anderson, I. C., M. Rhodes, and H. Kator. 1983. Seasonal variation in survival of Escherichia coli exposed in situ in membrane diffusion chambers containing filtered and non-filtered estuarine water. Appl. Environ. Microbiol. 45: 1877-1883. Rhodes, M. W., I. C. Anderson, and H. I. Kator. 1983. In situ development of sublethal stress in Escherichia coli: effects on enumeration. Appl. Environ. Microbiol. 45: 1870 - 1876. 2015 - Anna Murphy (PhD) co-advised with Mark Luckenbach. Effects of commercial clam aquaculture on biogeochemical cycling in shallow coastal ecosystems. 2013 - Richard Secrist (M.S.) co-advised with Mark Luckenbach. Food Availability and Utilization for Cultured Hard Clams. 2012 - Johnathan Daniel Maxey (M.S) Food Availability and Utilization for Cultured Hard Clams. 2012 - Meaghan Whitehead (M.S.) The role of nitrogen fixation as a source of new nitrogen to the New River Estuary, NC. 2009 - Juliette Poleto Giordano (M.S.) co-advised with Mark Brush. Nutrient Loading and System Response in the Coastal Lagoons of the Delmarva Peninsula. 2003 - Amber Kozak Hardison (Ph.D. Candidate) Co-advised with Liz Canuel. The Influence of Macroalgal Blooms on Biogeochemical Processes in a Shallow Coastal Lagoon: A Dual Isotope Tracer and Biomarker Approach. 2003 - Jennifer Wu Stanhope (M.S.) co-advised with Jim Perry. Relationships between watershed characteristics and base flow nutrient discharges to Eastern Shore coastal lagoons, Virginia. 2002 - Tami Lunsford (M.S.) A Comparison of the fate of Dissolved Organic Matter in two coastal systems: Hog Island Bay, VA (USA) and Plum Island Sound, MA (USA). 2000 - Scott Neubauer, (Ph.D.) co-advised with Richard Wetzel. Carbon Dynamics in a Tidal Freshwater Marsh. 1999 - Craig Tobias (Ph.D.) co-advised with Liz Canuel. Nitrogen Dynamics at the Groundwater- Saltmarsh Interface. 1998 - Yongsik Sin (Ph.D.) co-advised with Richard Wetzel. Phytoplankton Dynamics in the York River Estuary: Field Studies, Experimental Investigations, and Simulation Analysis. 1996 - Betty Berry Neikirk (M.S.) co-advised with Richard Wetzel. Sediment-Water Interactions in a Coastal Spartina alterniflora Marsh. Dean's Prize for the Advancement of Women in Marine Science, awarded May 2003. Distinguished Publication Award--USDA Forest Service for: Anderson, I. C., Poth, M. A., Homstead, J., and Burdige, D. J. 1993. A Comparison of NO and N2O Production by the autotrophic nitrifier Nitrosomonas europaea and the heterotrophic nitrifier Alcaligenes faecalis. Appl. Environ. Microbiol. 59: 3525-3533, February 1996. Distinguished Publication Award--USDA Forest Service for: Enhanced biogenic emissions of nitric oxide and nitrous oxide following surface biomass burning. Journal of Geophysical Research, Vol. 93, pp. 3893-3898, April 20, 1988. Postdoctoral Fellowship, National Research Council, Atmospheric Sciences Division, Langley Research Center, Hampton, VA. 1984-1986. American Society of Engineering Education Fellowship, Atmospheric Sciences Division, Langley Research Center, Hampton, VA. 1982-1984. 3D Dynamic Mapping using ACROBAT, Profiler and selected fixed stations. Collaborators include H. Kator and M. Brush (all at VIMS). Effects of Military Activity on Benthic Processes in the New River Estuary, North Carolina. 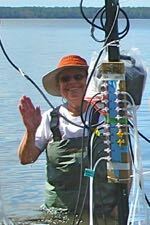 Collaborators include H. Paerl (UNC-CH), C. Currin (NOAA, Beaufort), M. Piehler (UNC-CH) M. Brush (VIMS), J. McNinch (VIMS). The role of benthic microalgae in regulation of carbon and nitrogen turnover in Virginia and Maryland Coastal Bays. Collaborators include C. Tobias (UNC-W), J. Vallino (MBL), and E. Canuel (VIMS). Improved Performance Capabilities for the Acrobat Towed Instrument Platform: Data Collection, Calibration and Interpolation/Graphic Visualization. Collaborators include L. Haas, H. Kator, J. Shen, M. Brush (all at VIMS). An integrated approach to understand relationships between shallow water benthic community structure and ecosystem function. Collaborate with L. Schaffner (VIMS).